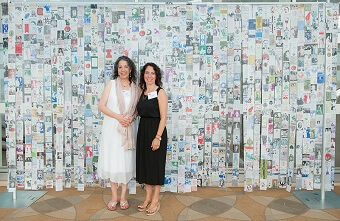 Artists Leah Sobsey and lynn Bregman Blass with the Living Legacy Tapestry at the 20th Anniversary Celebration. Eighty-five individuals and families have chosen leave a bequest – a gift specified in their wills– or other type of planned gift to Rose Community Foundation as part of their future and estate planning. In its 20th anniversary year, the Foundation celebrates these generous donors, and their inclusion in the unique Living Legacy Tapestry. Those who have made legacy gifts do so for many different reasons, and with clear intentions for their philanthropy. Some choose to make an unrestricted gift to Rose Community Foundation, which the Foundation will direct towards the community’s most pressing needs in the future. Others fund a donor-advised fund which their loved ones may direct after they are gone. Donors with very specific intentions can designate funds held at Rose Community Foundation to benefit a specific area of community need or nonprofit organization(s). “A legacy gift to the Foundation can take many different forms. These individuals are entrusting us with this part of their philanthropic legacy. We take that responsibility seriously and recognize the importance of honoring their intent,” Dansky explains. If you would like to make a legacy gift, please contact Patrick Sablich at psablich@rcfdenver.org, or 303.398.7437.